1. 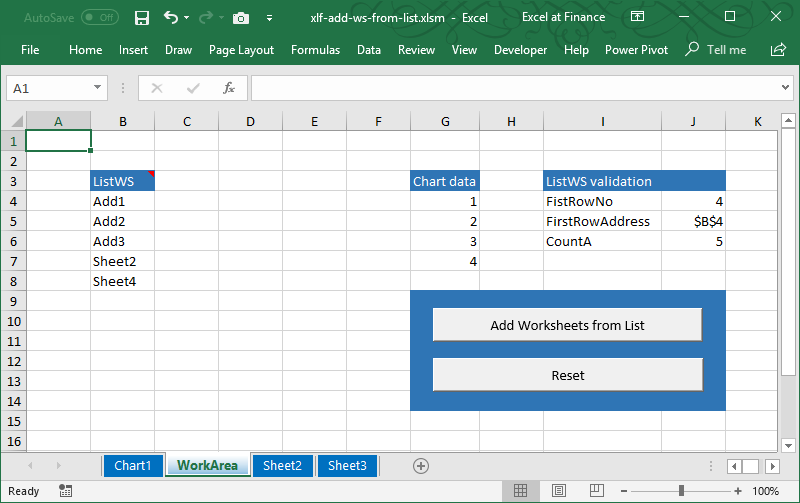 Write a Public procedure to add a set of new worksheets to the Workbook. Name the procedure ListAddWS. The worksheet names are in the Range name ListWS (with workbook scope) and the first one is added at position 2. 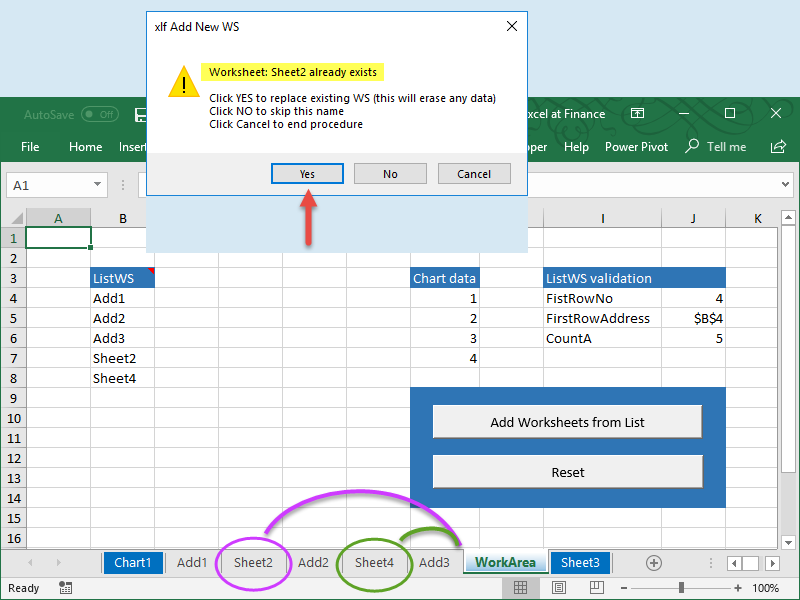 Include error trapping for the case when the Worksheet name(s) already exist(s). 2. Include a separate Reset procedure. The following code and discussion is based on the sample WB shown in figure 1. Fig 1: the Initial WB with 4 sheets, all visible, and 5 names in the ListWS range including 1 duplicate sheet name. Here is some suggested code, based on initial settings and stated assumptions from the code window. Const List As String = "ListWS"
"Click Cancel to end procedure"
Click No to skip this name - code 1 line 59. The new sheets are added from position 2, initially held by the WorkArea WS. Existing sheets are pushed to the right. The Reset procedure, from code 2, restores the initial WS settings shown in figure 1. Fig 2: the No action is selected from the message box and the sheet additions are completed. The message box is an image overlay an appeared before the procedure completed. Click Yes to replace existing WS (this will erase any data) - code 1 line 58 produces the result in figure 3. New sheets are added from position 2, but Sheet2 and Sheet4 are in the incorrect order! A correction of this problem (the k index counters in code 1) is not part of this module, and will be a task assigned later. The use of on-sheet Form Controls presents challenges with the Enabled property. Although the statement Worksheets("Workarea").Buttons("Button 2").Enabled returns True or False, the statement Worksheets("Workarea").Buttons("Button 2").Enabled = False, does not grey-out the control or disable the macro. A work-around is provided in code 3, but not implemented in this module. Clicking the disabled button, with OnAction set to "" activates edit mode. You could use a dead macro such as Disabled (see code 3) to prevent edit activation. A better solution is available by using ActiveX controls.